When looking at the eyes of people or couples, everything will look the same. But, it turns out the microscopic structure of the eyes of every person looks different from each other. More surprisingly, its structure turned out to resemble the planet. 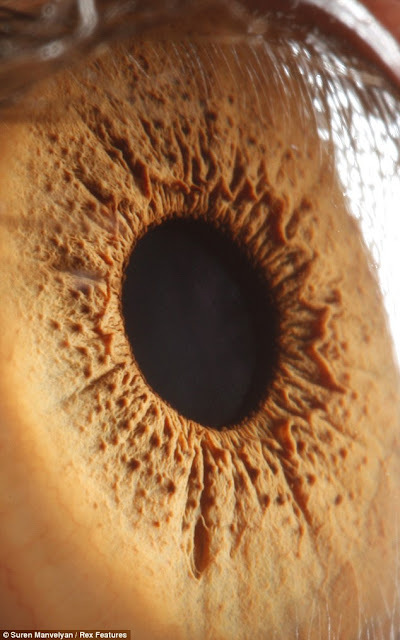 Look at the microscopic structure of eye images taken by a physics teacher named Suren Manvelyan. The photos show that the edge section displays a black eye every person has different wrinkles like the surface of Mars or the like. Manvelyan coming from Yerevan, Armenia said, "I never thought that such a complicated structure. We see the eyes of hundreds of people, but we do not realize that its structure is very beautiful, like a planet." In taking his picture, Manvelyan focus on the iris which controls much less light entering the eye and pupil, the iris associated with the muscle. Eye structure exhibited in the photographs Manvelyan titled 'Your Beautiful Eyes' is owned by students, friends and colleagues. Image retrieval techniques, Manvelyan said, "The process of uptake into my secret." In addition to being a teacher, Manvelyan since the age of 16 years has been experimenting with photography. Now, he also became one photographer in Yerevan Magazine, the lifestyle media Armenians in Canada.